Sounds so simple. Right? Unfortunately, it’s not always this easy. Now I’m not here to re-invent the wheel. These strategies are tried and true. What I am going to do is share how important it is to know the personality style of each member of the team. What are their true motivators, desires and preferences, and why that’s key to building an effective workplace team. I’ve seen so many situations where people get hired for the wrong role. They may have the greatest resume and awards rivaling Meryl Streep, but they may not have the skills or the emotional fortitude to be successful. Building a successful team takes work. Some managers want “mini ME’s”; someone that has the exact same work style and behavior. Well, that can backfire. Having the same style can cause friction, conflict and unmet expectations. For example, having two Dominant personalities can and usually will, lead to a power struggle. Since they are both competitive, they will want to win every battle at all costs. When teamwork and a collaborative environment are crucial for success, understanding a candidate’s natural tendencies allows you to place the right person in the right role. For me, this is the most important, and it’s a two-way street. As you provide direction for your team, it’s just as important to be open for feedback. First, have they all understood your directive? Based on our styles, we “hear” things differently. The last thing you want is someone leaving the kick-off meeting asking what you meant by “vision.” If one or more of your team members are confused, it’s your job to tweak or adapt your message in a way that he or she understands. 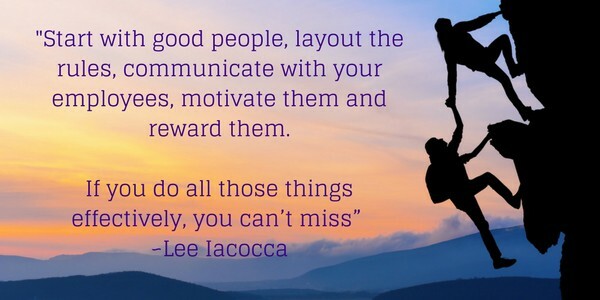 Investing time, attention and genuine caring about your team’s successes goes a long way. If you’ve done your homework during the hiring process, you’ve learned what really motivates each member, and you’ve identified the approach that’s most rewarding for them. For some, it may be cash. For others, it may be the recognition and the ‘employee of the month’ parking space. The goal here is make your team members feel valued and appreciated for their contributions. As I stated earlier, it’s not easy building a successful team, but it has, and can be done. As a leader, begin with self-awareness. The more you know about your own style will only enhance your knowledge of communicating with and leading your team. Understanding each individual’s strengths and blind spots will help you design custom rewards that will ultimately increase their motivation and engagement. What are some of the strategies that you’ve used to structure a winning team? Which ones didn’t work, and why? We’d love to hear them! Feel free to post in the comments below. Feel like there may be areas you’d like to improve? Let’s talk about it. Schedule a free 20 minute call today?